Waxwork Records out of New Orleans has been building their library of releases with some great horror scores and soundtracks. They have also been introducing invention into the format with a variant “Oldsmobile Delta 88 Yellow” vinyl LP for The Evil Dead 2 soundtrack to the Creepshow 2 soundtrack on white vinyl in the shape of an oil slick (a reference to “The Raft” segment from the movie. In a short time, Waxwork has set their sights on evolving by adding video game soundtracks (Castlevania 2: Simon’s quest) and releasing early recordings from established artists (White Zombie’s Soul Crusher) and now an all original comic book with its very own vinyl soundtrack. 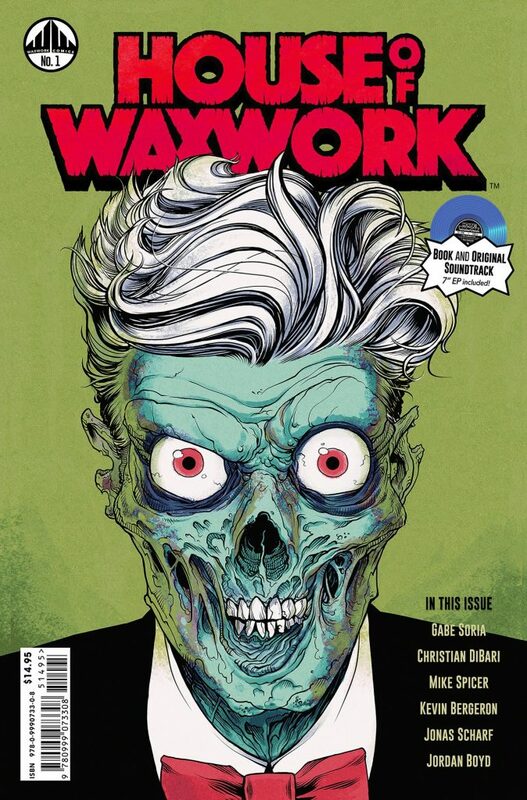 HOUSE OF WAXWORK is a 32-page comic featuring all-new content from modern writers, illustrators and composers. The story is set up as an anthology much like a Tales From The Crypt or an episode from Tales From The Darkside with a punny series host called the “DIE-RECTOR”. Each story is introduced with its very own hugely impressive movie-styled poster which will go straight to the heart of collectors out there. These posters set up each story as if they are movies, reflecting imagery that entices the reader into the stories. There are two stories contained in this issue: “Occult Slumber Party” and “Lighthouse Keeper.” The first starts off with a family stopping to shop at an old out of the way antique shop while traveling on vacation. They discover an old board game which they lug to a cabin deep in the woods. Things turn for the worse once the daughter rolls the dice to 6-6-6 and the family is thrust into a real-life game of life and death with only an hour to discover a way out of it, or suffer being stuck in the game forever. 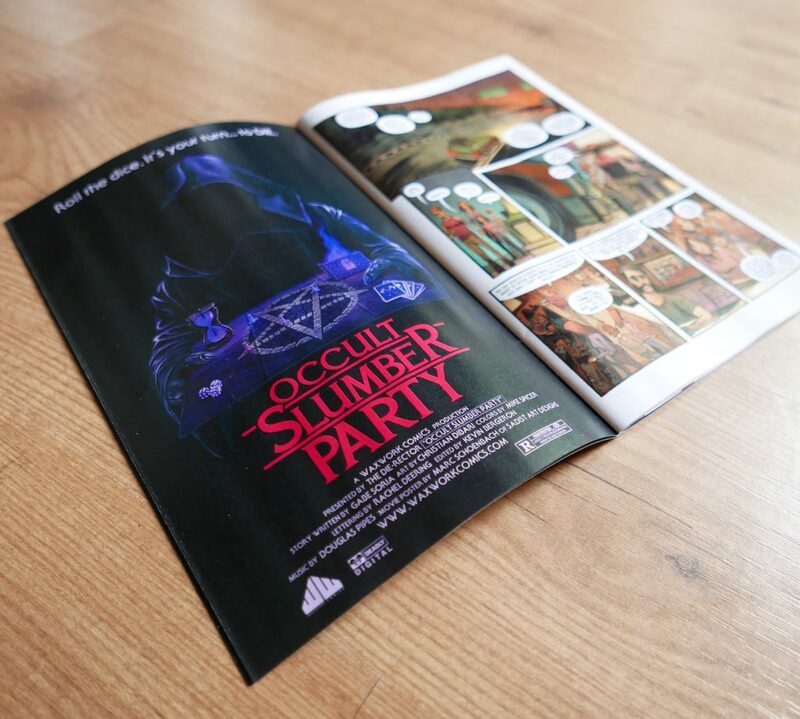 Occult Slumber Party has moments of suspense and a few monsters, traps and even human casualties, although it has the shortcomings of all short stories – it’s a bit too brief. The second story, “Lighthouse Keeper”, tells the tale of recently released inmate looking to make a fresh start. He takes a job which is set to last three months maintaining an offshore lighthouse which has a horrible history. One night a large storm hits near the end of his tenor and the caretaker begins to hear voices and is assaulted by the undead corpses of women who seemingly blame him for their death. I won’t spoil any more of the story for you. Suffice to say that if expanded, it could be a great comic in itself; as a mini story it takes away a little of the flow and structure that could have made it great. I’d love to maybe see this particular story revisited with a different caretaker in a future issue. Overall the record/comic book idea works very well and is a great starting point for what could evolve over time. Both stories are brief but solid. The soundtrack is such a great idea and adds to the experience immeasurably. I can’t wait to see what Volume 2 brings. -Featuring Gabe Soria, Christian DiBari, Mike Spicer, Kevin Bergeron, Jonas Scharf, Jordan Boyd, Marc Shoenbach, Gary Pullin. -All Original Music by Rami Sharkey, Kevin Dredge, The Budapest Scoring Symphonic Orchestra, Douglas Pipes, and Creeper.